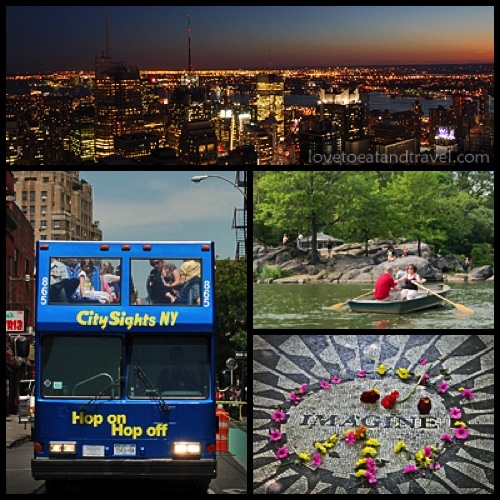 If this is your first visit to New York, we always recommend that you take a “Hop-On Hop-Off “Double Decker Bus Tour. 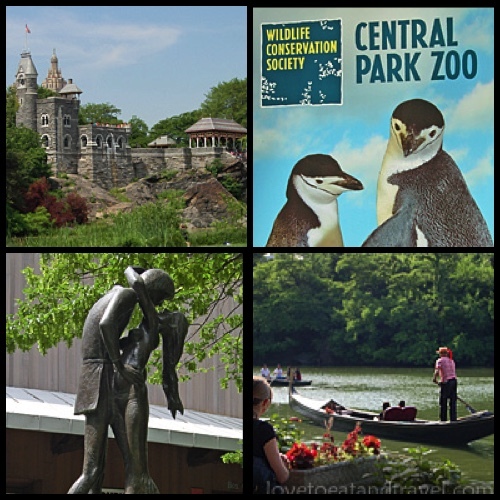 It’s one of the best ways to see the city’s top tourist attractions. And it’s a lot of fun, especially sitting on the upper open-air deck where you get a great view of all the sights – and the people! Hop-on-and-off at your leisure throughout the day or stay on the bus for the whole ride – you can always go back to the places you want to spend more time visiting. Another fun thing to do is to see New York City at night, when it really comes alive. Enjoy a Free “Shakespeare in the Park” play – they take place every Summer at the Delacorte Theater. It’s really fun under the stars at night. NYC’s most famous skyscraper continues to be one of the city’s most visited attractions – so it’s good to get your tickets in advance. Enjoy breathtaking panoramic views of the Manhattan skyline. Originally the tallest building in the world, the 86th floor Observation Deck of this 102-story building offers stunning views of New York City. If you want to save even more time during peak summer season, consider getting the “skip-the-line” upgrade option when you buy your tickets. Another place that we like even better than the Empire State Building is the “Top of the Rock” Observation Deck atop Rockefeller Center – 70 floors up. The views of the NYC skyline are absolutely breathtaking, especially at sunset and after dark (see top picture). Enjoy an unobstructed “open-air” 360-degree view of Manhattan. See world-famous landmarks, including The Chrysler Building, Times Square, Central Park, the Hudson River, the East River, Brooklyn Bridge, the Statue of Liberty – and get the most spectacular view of the Empire State Building (see the illuminated skyscraper picture below). History and architecture buffs won’t want to miss visiting St. Patrick’s Cathedral, located across from Rockefeller Center (at 5th Avenue, between 50th and 51st Streets). The stunning Neo-Gothic-style Roman Catholic Cathedral is visited by over five million people every year. Marvel at its spectacular interior, beautiful stained-glass windows, ornate columns, and giant organ with over 7,000 pipes. Free guided and walk-in tours are available. If you’re interested in visiting the crypt where the Archbishops of New York are buried, you need to make an appointment. Group tours are also available. If this is your first time to New York, be sure to visit the Statue of Liberty, located on Liberty Island, just off the southern tip of Manhattan Island. 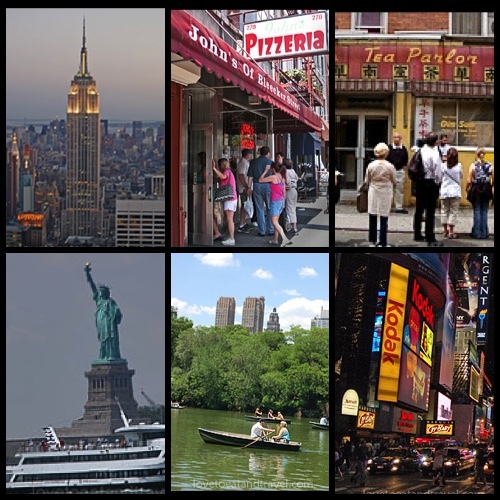 It’s one of New York City’s most popular tourist attractions, drawing up to 14,000 visitors daily. This 4 1/2 hour guided tour starts by getting skip-the-line priority boarding on the ferry to Liberty Island. Explore the area before going inside the statue’s pedestal and up to the observation decks where you’ll see stunning views of New York City, New Jersey and Ellis Island. After your visit to the Statue of Liberty, take the ferry over to Ellis Island, one of the nation’s most popular historic sides. Enjoy a guided tour of the Immigration Museum and see exhibits at the Great Hall. Did you know that between 1892 and 1924, over 25 million immigrants passed through NY’s Harbor’s gateway to freedom. 90% were cleared through and 98% stayed in America. Today, one in three Americans claim to have an ancestor who passed through Ellis Island. The Guggenheim – designed by Frank Lloyd Wright, it’s one of the city’s most iconic architectural landmarks. If you have time while you’re in the Times Square area (theater district), be sure to see a Broadway Show. This all-access walking tour includes a 1 1/2-hr guided tour of Ground Zero and the 9/11 Memorial, plus entry to the 9/11 Museum and One World Observatory. The tour begins at St. Paul’s Chapel, the oldest public building in NYC, located directly across from the World Trade Center site. From there, your guide will lead you to the Firefighters (FDNY) Memorial Wall and the Engine and Ladder Company 10/10 (Ten House) fire station at Ground Zero. Next stop… the National September 11 Memorial (9/11 Memorial) – a tribute to the nearly 3,000 victims of the 2001 terrorist attacks. Get an up-close view of the massive twin reflecting pools and fountains as you listen to moving stories from your tour guide of that infamous September day. Inscribed in bronze around the twin memorial pools you’ll see the names of people who perished in the attacks on February 26, 1993 and September 11, 2001. The twin pools feature the largest manmade waterfalls in Northern America. LED lights at the base of the pools illuminate the water at night. At the end of the tour, your guide will give you timed-entry tickets to the National September 11 Museum where you can enjoy a self-guided tour at your own pace. See a collection of original artifacts (including actual pieces of the towers), multimedia displays, archives and video screenings pertaining to 9/11. FYI… the lives of every victim of both the 2001 and 1993 terrorist attacks are commemorated at the museum. After touring the museum, you’ll visit One World Trade Center (Freedom Tower), NYC’s tallest skyscraper to experience One World Observatory on the 102nd floor. How do you get there… via a “Sky Pod” elevator, rising 1,250 feet in the air in under 60 seconds – that’s quite a rush! On the observation deck, take time to enjoy breathtaking panoramic views of Manhattan’s skyline.